At the U.S. naval base in Guantánamo, Cuba, the prisoners are making art. Their studio is a cell in Camp 6, where about two dozen detainees are housed. The men, many of whom have been there since the prison opened in 2002 and none of whom have been charged with any crime, are shackled to the floor and to the table while they draw. Their subjects are often pictures their teachers—most recently an engineer who seems to have no training in art — have photocopied from art books or magazines like National Geographic. Though the United States spends nearly $11 million per prisoner per year, art-making materials are scarce. Detainees often depend upon their lawyers for paint or art-instruction books. The artists are inventive, even playful, in finding ways to work around the lack of materials. Khalid Qasim, a detainee currently on hunger strike, created an interesting texture for his painting of the Titanic (the film was shown by prison authorities) by mixing glue into bits of gravel, sand and rock gathered from the prisoners’ recreation area and then layering the mixture onto his cardboard “canvas.” Moath Al-Alwi spends hours every day in his cell constructing model boats and other sculptures, using only a small pair of children’s scissors to shape the cardboard. For sails on a two-foot-long model of a ship from the age of exploration, he used pieces of a T-shirt stiffened with glue. The wheel is fashioned out of a plastic bottle cap, and dental floss connects the rudder to the cardboard hull. Most of the 779 men and boys detained at Guantánamo over the years as “enemy combatants” in the “war on terror” have been released without ever being charged. Today only 41 remain, 15 in a top-security part of the prison called Camp 7. The others — sometimes called “forever prisoners” because the United States claims the right to hold them indefinitely — are in Camp 6, where they live more communally and are allowed to take classes in such things as Spanish and Arabic calligraphy. One of the most popular, Navy spokesperson Anne Leanos told The Indypendent via email, is art. Art classes at Guantánamo began in the early years of the Obama administration. The first artworks left the prison through the International Red Cross, which helped detainees send it to family members. Around 2015, prisoners started being allowed to give their lawyers their art, either as gifts or for safekeeping. Lawyers have accumulated hundreds of pieces of it, much of it kept in their offices. Erin Thompson, an art professor at City University of New York’s John Jay College of Criminal Justice, first heard about the art when lawyers for the detainees approached her with the idea of mounting a show. DESOLATION ROW: Many of the detainees come from landlocked regions. At Guantánamo, they can hear the ocean day and night but are prevented from seeing it by their captors. Courtesy of Djamel Ameziane/John Jay College. In October 2017, the world at large learned about the Guantánamo artists when the first major display of their work, entitled “Ode to the Sea,” opened at John Jay. The exhibit contained 36 paintings, sculptures and drawings by eight detainees. Included were Al-Alwi’s model ship and Qasim’s painting of the Titanic. Instead of exhibiting the art in one of the college’s regular art galleries, Thompson and co-curators Paige Laino and Charles Shields decided to mount the exhibit in a sixth-floor hallway leading to several administrative offices. At the time, Thompson told The Indy, she thought the exhibit wouldn’t excite that much attention. But just the opposite occurred: the show received positive media attention and people, curious to learn something about the anonymous prisoners of Guantánamo, sought it out. The show drew more attention a few weeks after the opening when a Department of Defense spokesperson announced that, pending a policy review, no new art would be leaving Guantánamo, and an inmate reported to his lawyer that a guard had told him all future art would be burned. The policy review concluded that “items produced by the detainees at Guantánamo Bay remain the property of the U.S. government,” Pentagon spokesperson Sarah Higgins told The Indy via email, so there will thus be no further “transfer of detainee-produced artwork from the detention facility.” The reason, she explained, was that detainee artwork “was being sold to third parties.” Art in the exhibit by some of the four detainees who have since been released and are now living abroad was offered for sale. However, Ramzi Kassem, a professor at CUNY School of Law, where he and his students in the Immigrant and Non-Citizen Rights Clinic represent Moath Al-Alwi, told The Indy that prisoners have become “disheartened” over the thought that they will no longer be able to share their art with the outside world and especially with their families. Confiscation of art at the prison is, unfortunately, also not new. In 2013, when over 100 prisoners went on hunger strike, guards removed the art in their cells and never returned it. Recently, a ship by Al-Alwi that Kassem says was even more sophisticated than the one in Ode to the Sea was confiscated by guards, who said it was too big for his cell. Al-Alwi fears that the ship, which he had worked on for three months while sleeping only four or five hours a night, has been destroyed. He had hoped to send it to his mother in Saudi Arabia. Carol Rosenberg of the Miami Herald reported that the art display was not included in a media tour of the prison in early February, the first in six months. Both Rosenberg and NPR’s David Welna reported tense interactions between prison authorities and journalists and many new restrictions on reporters. Welna said they were shown a nearly completed prisoner health clinic with shackles on the floor, but not allowed to photograph them, and were told about plans to replace Camp 7 with a new prison and to build a barracks for over 800 troops. 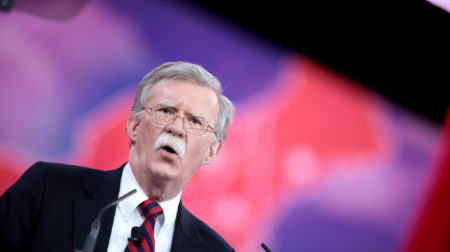 A few days before, President Donald Trump announced he had signed an executive order rescinding President Barack Obama’s 2009 directive to close Guantánamo. Trump wanted it open, he said, so “terrorists wherever we chase them down” could be sent there. Guantánamo detainee Moath Al-Alwi made a larger version of this boat he intended to share with his mother in Saudi Arabia. Now he fears that it has been destroyed by guards. Courtesy of Moath Al-Alwi/John Jay College. In the exhibition catalog, she explains that artists must balance the need to show authorities they don’t harbor negative emotions with the need to express themselves. The sea, Thompson writes, “contains powerful emotions under an innocuous surface.” Paintings of a gloomy lighthouse, its light extinguished, or of two empty boats, unmoored, floating side by side illustrate her point. When Hussain was asked whether any of the detainees’ lawyers could give a description of art that has been banned, she explained that even a verbal description would have to be cleared by military censors. For more or to view the exhibit, see artfromguantanamo.com. 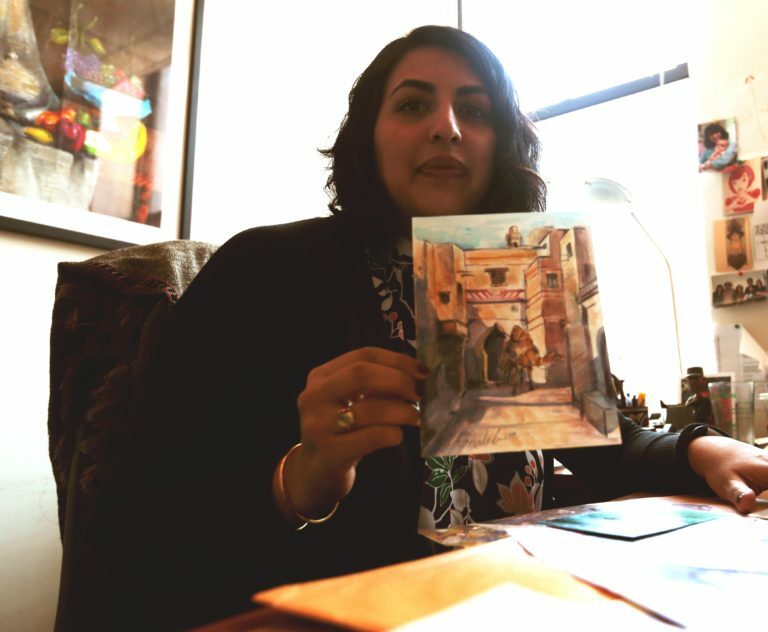 Photo (top): Aliya Hana Hussain of the Center for Constitutional Rights displays one of 200 paintings and drawings that CCR has received from Guantánamo detainees it has represented.